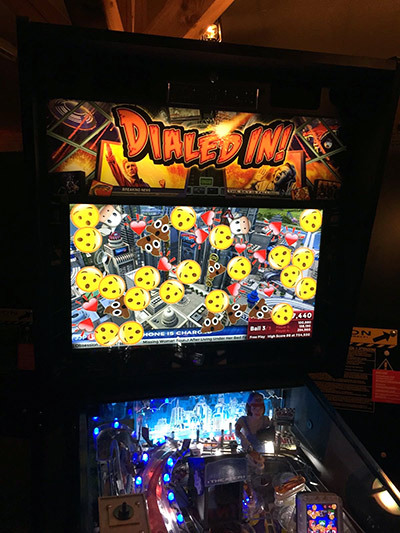 As the European Jersey Jack Pinball Master Distributor, Alfred Pika, aka Freddy, hosted the European launch of JJP’s latest Dialed In! 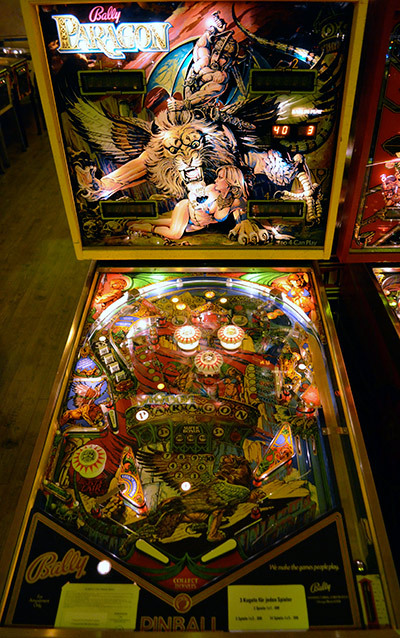 pinball machine designed by the legendary Pat Lawlor. 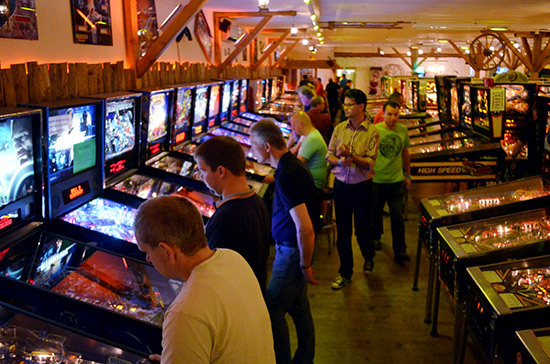 The venue was Freddy’s Pinball Paradise In Echzell. 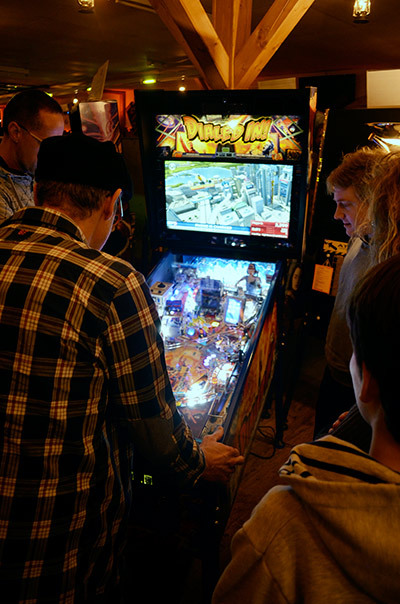 Freddy (left) looks on as attendees try out Dialed In! Attendance at the launch party was by pre-registration. The modest entry fee of €3 ($3,17/£2.60), as well as any donations for the available food and drinks, benefited a local kindergarten. 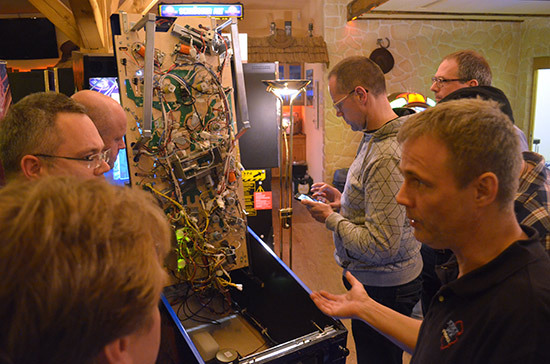 There was one prototype LE machine for the couple of dozen attendees to try out. Software was only about 30% completed, but, surprisingly, the game felt very polished with many modes to try. 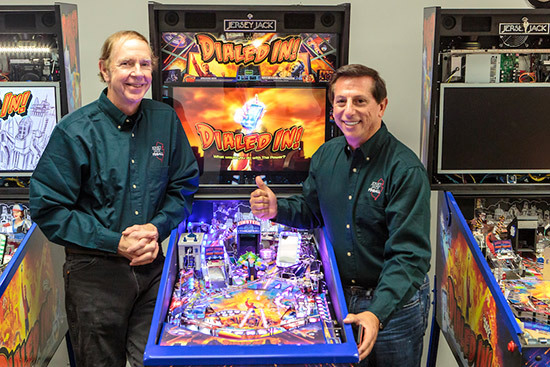 Pat Lawlor is one of the greatest pinball designers of all time, having designed many beloved tables, including the record selling 1992 The Addams Family, and his last Stern game CSI in 2008. 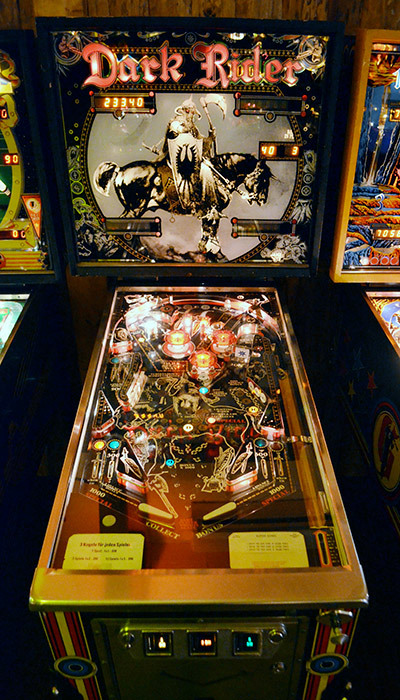 Lawlor began designing pinball machines in 1987 and produced eighteen games throughout his career, including many of the best-selling games in the history of the industry. 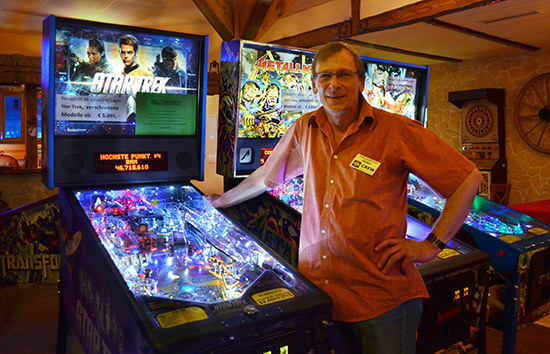 Jack Guarnieri recently recounted in the JJP newsletter how Pat’s return to pinball came about. Back in 2011, Jack rented a building in Harvard, IL from Pat and invited him to see the work JJP was doing on the The Wizard of Oz. As Pat witnessed first-hand JJP’s vision embodied in the making of their first game, he started toying with the idea of coming back to the industry. 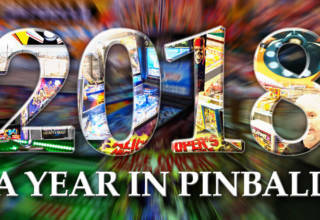 In January 2014, to much excitement in the pinball community, JJP made the official announcement that Pat was coming out of nearly ten years of retirement to design an unlicenced game for JJP. Move the electronics back in the backbox for ease of access and added reliability. And Improve serviceability access of cabinet head. One of the most impressive serviceability design we saw was the new LCD mount. 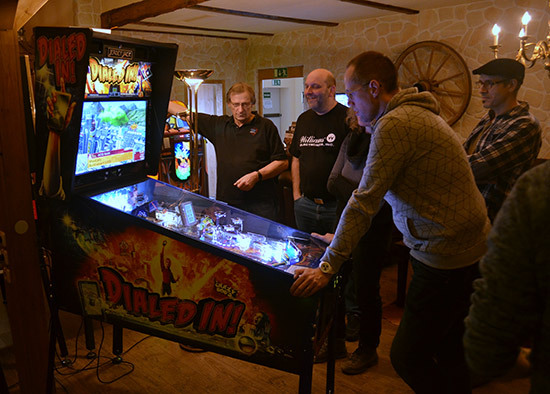 After you remove the translite, the LCD screen is mounted on a impressively smooth swinging arm which extends and pivots to either side to provide full access to the cabinet head electronics. It is also the first game to feature bluetooth connectivity, and the innovative ‘selfie mode’ showcased the game camera. It employs face recognition technology to capture portraits of the player and close bystanders. This mode and the cascading ’emoji mode’ were big hits with the attendees. 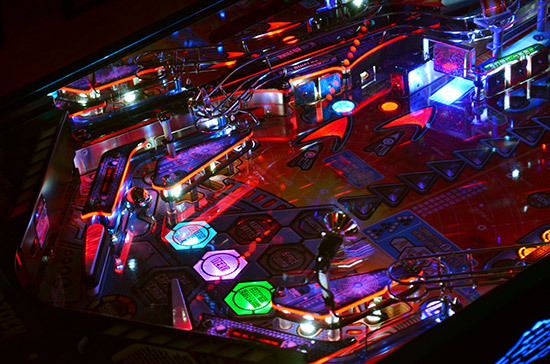 The crossing hashlines inserts in the playfield are a familiar sight from the Wizard Blocks prototype game that Lawlor sadly never got to complete due to WMS Industries shutting down their pinball division in 1999. 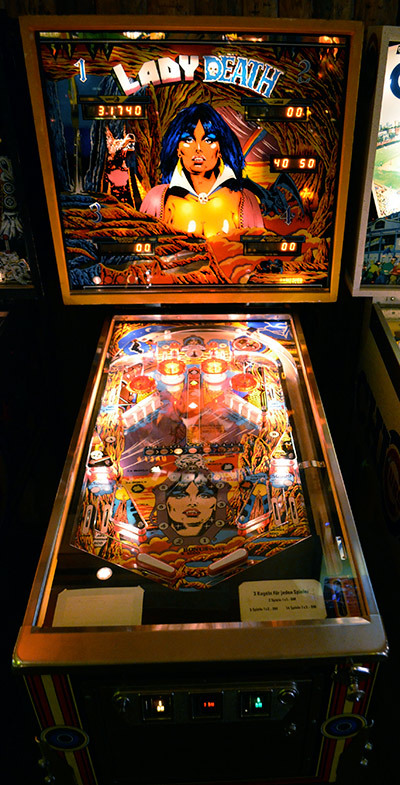 The Quantum Reality Theater toy in the middle was very impressive with a bright and crisp interactive floating image similar to Pinball 2000 for which Pat Lawlor was also a major creative force. The event was also the last day to order the game from Freddy at specially-discounted advance ordering prices. 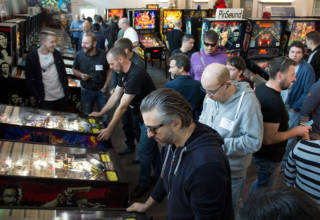 With a constant line to play the game during the whole event, and judging from the very positive reception of the game, one may guess there were quite a few games ordered that day. 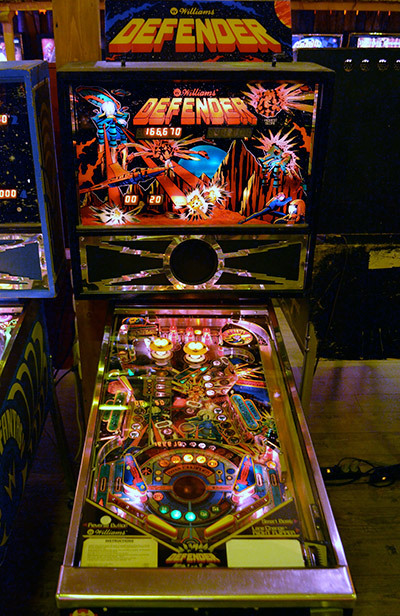 March 15th – 17th, Milan, Italy, Double Pinball showroom. 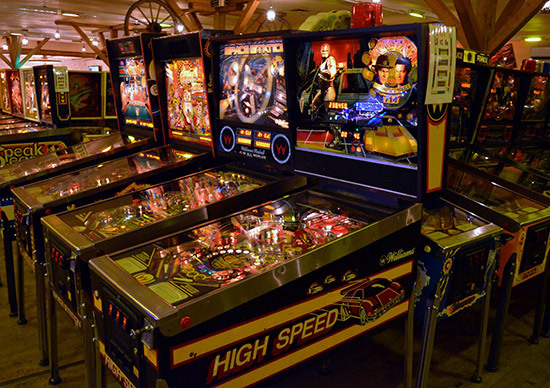 April 1st & 2nd, Le Treport, France, Flip Expo. April 8th & 9th, Oberösterreich, Austria, Comic Con. 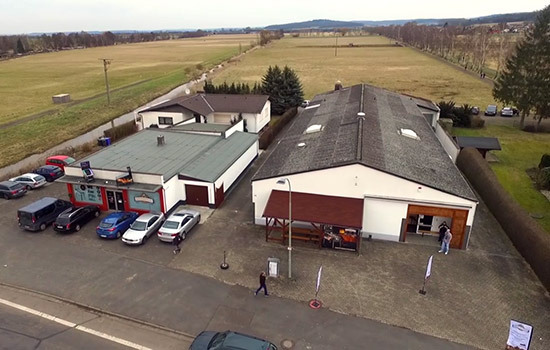 April 13th &14th, Badendorf in der Steiermark, Austria, ‘Auf Die Kugeln Fertig Los 3.0’ tournament. 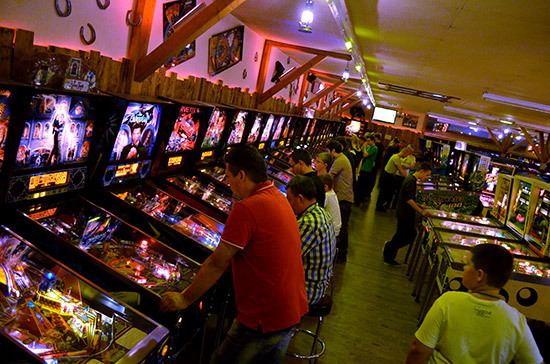 On the outskirts of the small village of Echzell, a 45- minute drive north of Frankfurt, it’s hard to miss these two pinball machines, beacons to all aficionados of the silver ball. A closer inspection reveals no coin doors, leg mounts or bracket backbox hinges. We can all breathe easy as it seems no game was sacrificed for the making of these ingenious props. 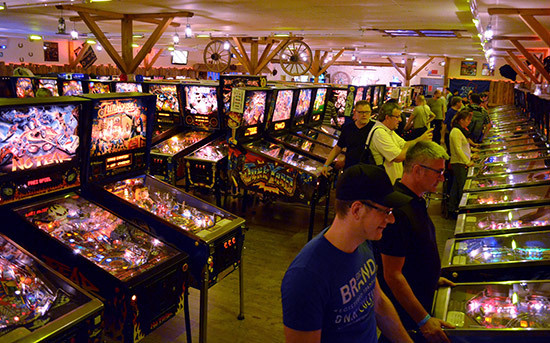 The store is on the left side, while the pinball hall is on the right. The hall is impressively spacious at 600 square meters (~6,500 sq. feet), a hint of its previous incarnation as a supermarket. The walls are adorned in a country and western decorative theme, with horse saddles, wagon wheels and horseshoes. 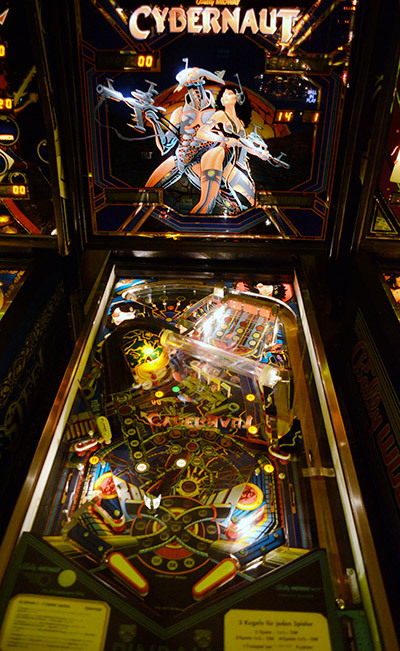 It houses about 170 pinball machines on free play, from 1960s electromechanical games to the latest Stern and JJP machines. 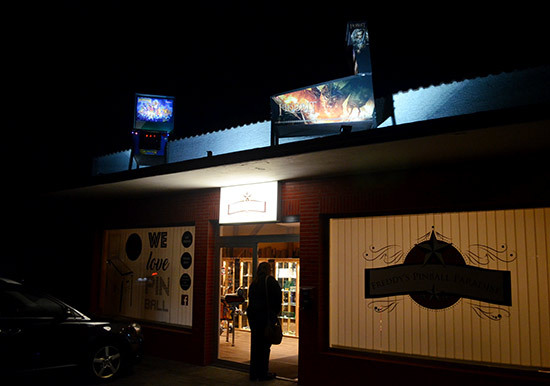 The shop was founded in the summer of 2012 and the Pinball Paradise hosted the 2013 IFPA World Championships. 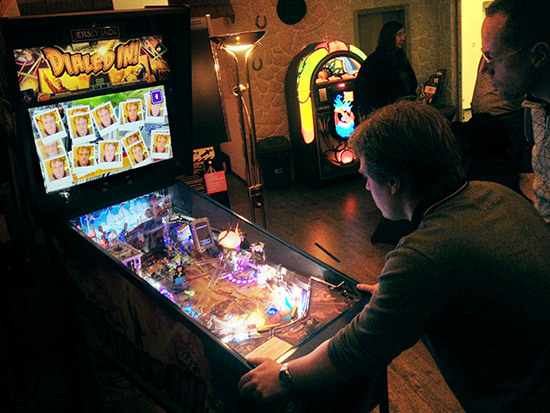 Freddy started buying and fixing games in his basement when he was just 14-years-old. 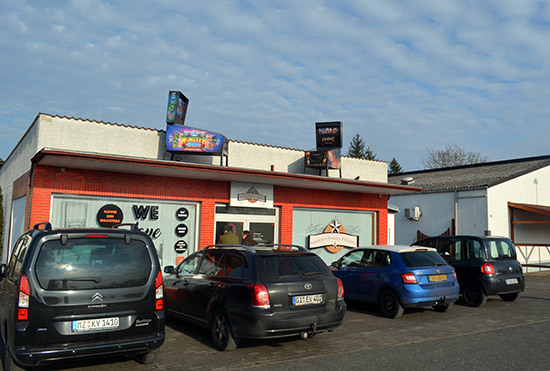 Along the way he also started a successful business, Pika Autoteile GmbH, which sells parts and accessories for US made cars. 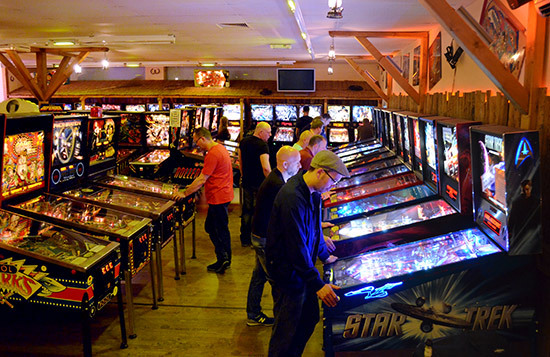 His right hand man for all things pinball related is Andy Hengstebeek. Andy is the main caretaker of the collection and he also looks after the shop. Andy told me about the rare Dark Rider conversion game in the collection from German company Geiger-Automatenbau. 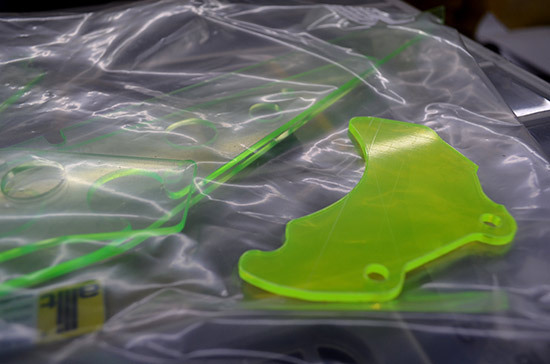 Only 150 of these conversion kits were made. Andy found this game in an old gym. 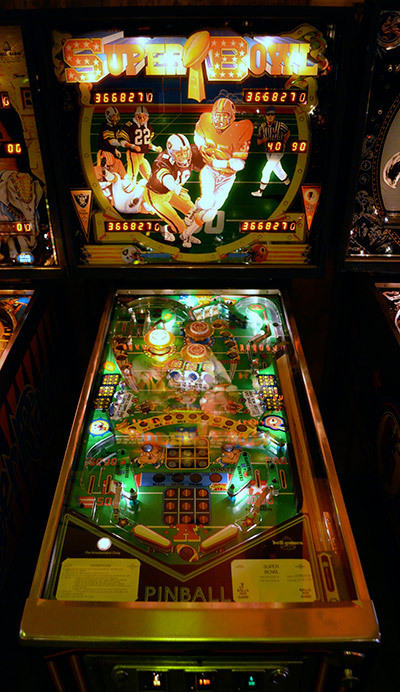 The playfield was completly white from rubbers having disingrated, but the playfield was pristine underneath. 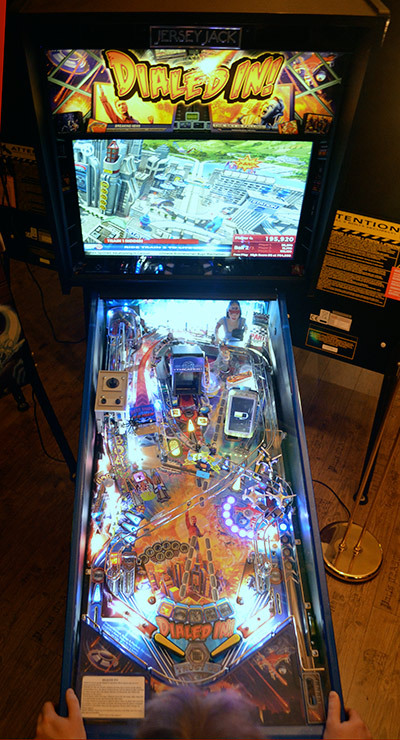 He explained that these Geiger conversion kits came out a few years after the originals, and by then usually people had moved on to the latest pinball playfield layout and feature gimmicks. 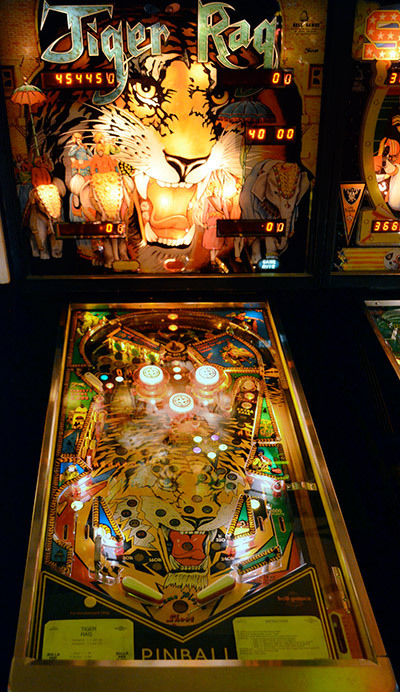 Freddy also sells the convolux plastic protectors which Pinball News had the opportunity to review in 2014. Many of the games at the Paradise were outfitted to showcase these protectors. 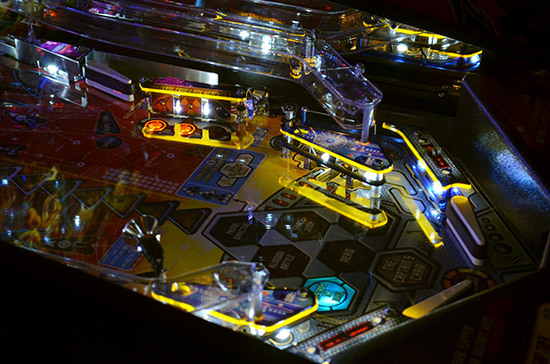 Here, on two 2013 Stern Star Treks, you can see how much Convolux protectors can change the mood of a playfield. Here are some pictures of the inside of the Paradise. 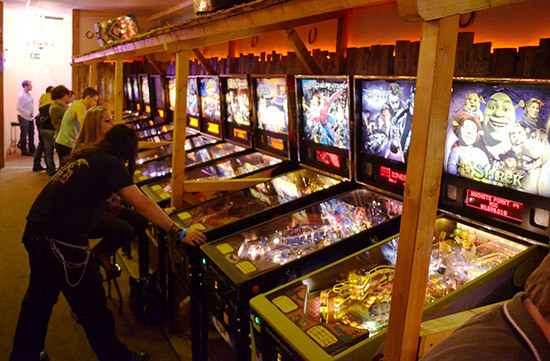 Freddy’s Pinball Paradise is open once a month, usually the last saturday of the month. Current admission prices are €18 for adults and €10 for children aged 12-16 years. Load More In DIALED IN!